The Leicester Tigers are delivering a programme of tag rugby sessions in Harborough, beginning next Thursday, October 22. 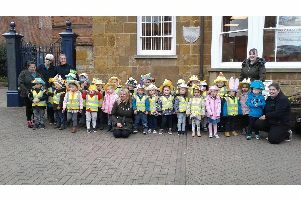 The five-week scheme has been launched in partnership with the Nottingham Building Society, which has a branch at Harrison Murray, in Harborough’s High Street. Next Thursday, the branch will be helping to launch the initiative alongside Tigers legend Louis Deacon, who made 274 first team appearances for the Tigers and earned 29 England caps, at 12.30pm. After the launch the organisers will be running a tag rugby session at a town school, which has not yet been named. Organisers say the session will be free to join in with. A spokesman for the organisers said: “We’re really planning on making a day of it, Welford, our mascot, will be there along with our Maul, hosting free games and activities including the Tigers Speed Pass Challenge, Tigers Tackle Bag and photo booth. We’d love people to attend.